Inspired by the originality of technical solution, published in the journal “modelist-Konstruktor” No. 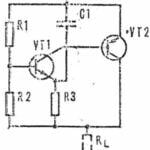 11’78, I modified the circuit for fluorescent lamps and for many years its use in residential lighting fixtures. As in the prototype, economical and not scarce ЛДЦ40 (ЛДЦ80) light up instantly, their work is not accompanied by annoying clicks and “wink” for missing an unreliable starter. And best of all — for such lighting you can even use the bulb. The proposed scheme represents a voltage multiplier. On the capacitors C1 and C2 is obtained twice, and the C3—C4 quadruple amplitude Iset (about 1200), which ensures a stable ignition is not only a new bulb but old, burnt or torn filament. Inductor L1 serves to limit current through the working ЛДЦ40 (ЛДЦ80). Capacitors C1 — C4 because of their small capacity work only at the time of starting the lamp, after which a noticeable effect on the scheme do not have. Due to the current-limiting choke easily set the required mode (for ЛДЦ40 is a — 0.2 A). However, its “fly in the ointment” is available here. Bulb with both otherwsie filaments sometimes run on as polished as I would like. Unfortunately, after prolonged use can manifest the effect of polarity, typical of other power schemes “lyuminestsentnym” constant current when LDTS or does not illuminate, or only slightly smoldering. 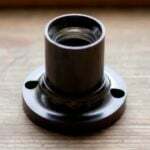 But it is necessary to reverse the polarity of the enable (insert the lamp into pin sockets “backwards”). and the efficiency of the lamp immediately restored. Now, the radio components that you can use when building circuits. Of capacitors is the best fit of MBM. K73-11 or their many counterparts. However, note that the operating voltage for C1 and C2 must be at least 400 V, and C3 and C4 is not less than 600 V. Diodes is acceptable of any type (КД105Г, КД221Г, КД209Б) with operating current, somewhat higher than the current lamp mode of operation. 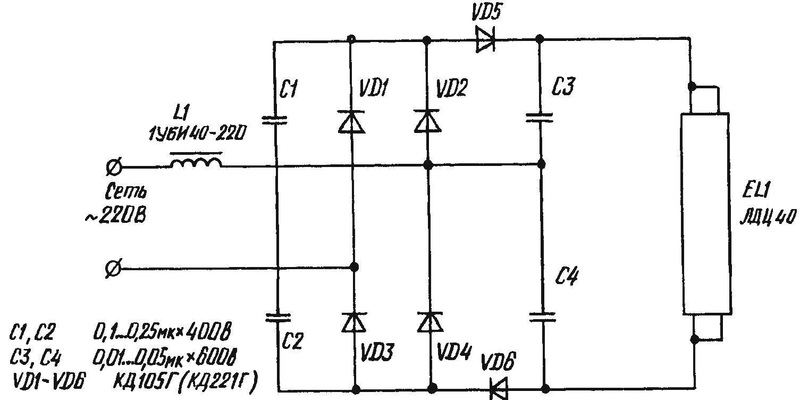 It is also necessary to reverse the voltage to VD1—VD4 not less than 400 V, and for VD5 and VD6 — not less than 600 V.
As diodes VD1—VD4 you can use a diode bridge type КЦ405А, КЦ402Г or their analogues. Inductor L1 from any luminaire with a lamp ЛДЦ40, for example, 1УБИ40-220. If desired, it can be replaced with a capacitor. For ЛДЦ40 takes about 6 µf, operating voltage 400 V. However, the scheme will work is much worse than with the throttle that provides more reliable and smooth turning on of the lamp. When using this development for betterthere run ЛДЦ80 need to increase the capacitance of the capacitors C1 and C2 to 0.5 µf, and C3 and C4 to 0,022 UF replacing the diodes and choke on more powerful counterparts. Instead of the latter, for example, you can apply 1УБИ80-220. Capacitors due to their small capacities, like the diodes, it is easy to integrate in almost any industrial lamp. Outside there is only the throttle, which can be arranged in the form of attachment, conveniently connected with the rest of the circuit.